Most of Frankfurt’s history revolves around its location, a swampy valley at the intersection of two river channels. Though artifacts can be found dating back to the Paleolithic period, the first settlements were of the Romans during the first century CE. After Roman settlement, the first reference to the name Frankfurt in history appears as ‘Franconofurd’ the “ford of the Franks” where the river could be traversed by wading. Charlemagne had a royal court here and in 822, his son Emperor Ludwig the Pious, ordered the construction of the residential areas of the city. In the years following this, from 1074 to 1150, different tariffs, fairs and festival names were coined after Frankfurt and in 1152, Fredrick Barbarossa was named king of Germany. By 1240, Frankfurt was known as a ‘safe passage’ for tourists and its reputation as a fair trade city was built because it was the most profitable city of Germany. After being elected as a ‘free imperial city’ in 1372, the first Town Hall was built in Frankfurt in 1405. For about four centuries after this Frankfurt went through civil and political unrest with the Romans, Americans and the Jewish settlements. It was in 1800 that the fortification boundaries surrounding Frankfurt were demolished and the population numbers slowly rose from 35,000 to 100,000 to 400,000 in 1905. Within this period the major monuments of the city were, including the Alte opera. 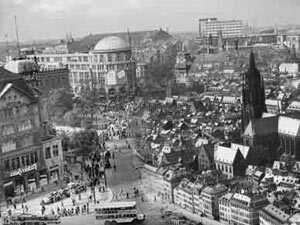 From 1948 onwards, Frankfurt witnessed an era of great development and progress with the opening of major banks, the establishment of an elaborate transportation system, and the growth of the city’s skyline with the addition of new skyscrapers. The Frankfurt we see today is one that carries a rich history of war and struggle. Every monument, park and alleyway has a story to tell.